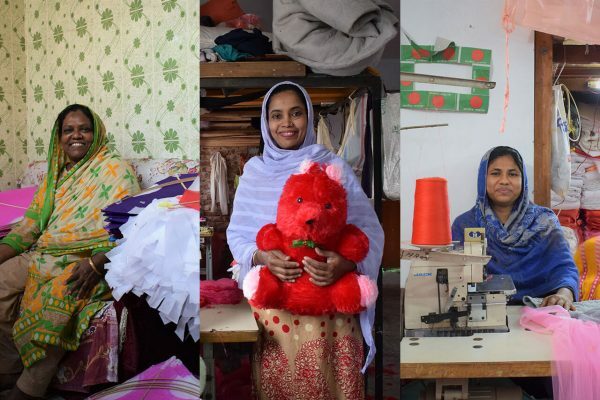 Northwestern Bangladesh – Par Bhangura, a little known village within Bhangura, a sub-district of Pabna, is home to some of the most enterprising people in the country. Many are unaware of the fact that Par Bhangura also happens to be the birthplace of the first Bangladeshi Ambassador to the United States, M Hossain Ali. 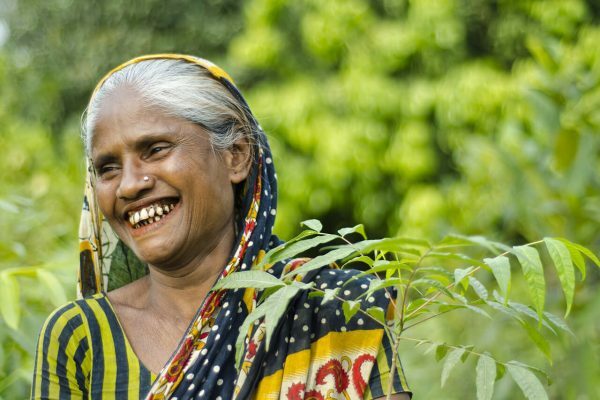 Bhangura was once renowned for growing the best jute in the country, but with time it gradually faded into obscurity. Fortunately, the people have always been actively involved in finding new ways to make a livelihood. Thanks to favourable climate conditions, the region quickly gained popularity for its milk and milk-based products like butter, ghee, curd and sweets. But constant interference of the middlemen, or ghosh as they are locally called, severely disrupted the dairy farmer’s ability to make fair profits. Coupled with factors like lack of preservation infrastructure and falling milk production, the prospect of becoming a dairy farmer was no longer lucrative. 27-year-old Mohammad Ripon Ali was among those who suffered considerable losses from owning cows and were forced into unemployment. In this time of crisis, Ripon’s father decided to arrange his marriage with the help of a local ghotok – a matchmaker. The ghotok scanned through the entire village and returned with a potential candidate. To Mahmuda’s family, however, the matchmaker painted a different picture of Ripon. Her family was impressed by what they heard, and quickly agreed to the proposal without further inquiry. They were soon married off. Mahmuda, having arrived at her new abode, was struck by the truth. Ripon had no cows. He was not a dairy manager, but a part-time labourer who did menial chores at other people’s farms. She was left feeling helpless in her new home with her new family. Ripon himself was finding it difficult to live with the fact that he had absolutely no means of supporting his new family. The prospect of a happy conjugal life seemed distant with each passing day. Ripon’s life took a turn one day, while helping a dairy farmer transport milk to the nearest BRAC Dairy chilling centre. 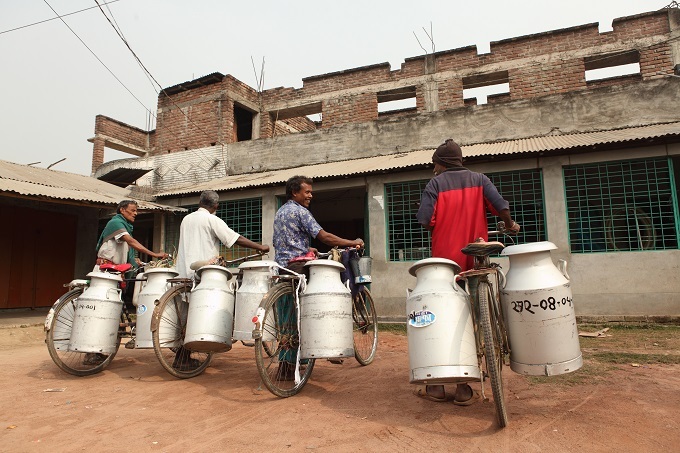 Initially, Ripon and Mahmuda managed to establish their home as a collection point for all the milk produced within a 10km radius. They received support from Ripon’s father-in-law in the form of BDT 10,000 (USD 120) to pay the farmers who were dropping off their milk. 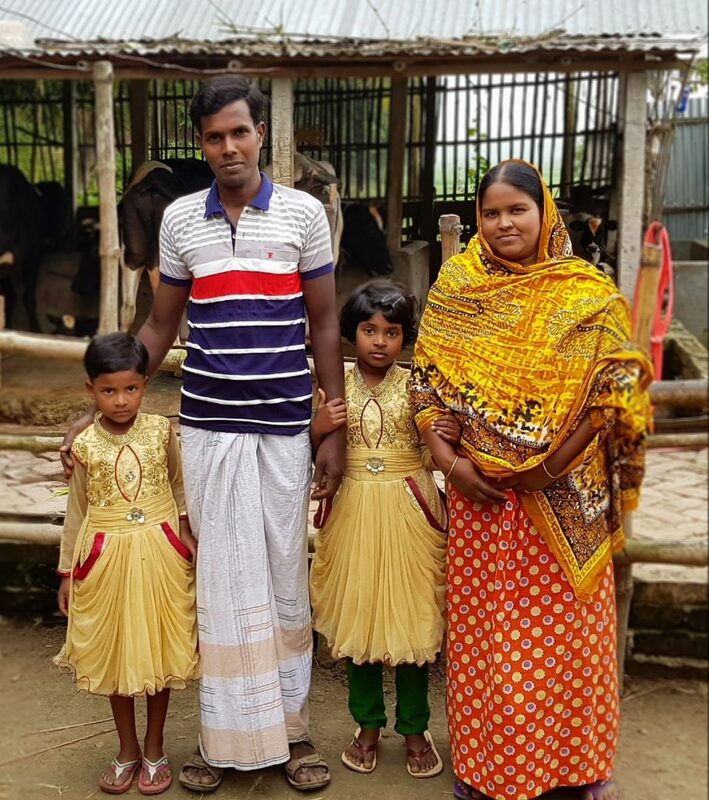 Mohammad Ripon and Mahmuda Khatun with their daughters. This operation continued successfully for over three years until Mahmuda gave birth to their first child. She and Ripon both agreed at that point that their current income was not enough to keep their growing family afloat. They took a loan of BDT 200,000 (USD 240) at 5% interest and bought two cows in 2009. Ripon purchased two cows in 2009 and started raising them with minimum supervision due to his past experience in taking care of cows. The couple never looked back since. With each passing year, their livestock consistently grew in number, along with their income. Currently, they have 14 cattle of varying gender and age, with seven of them being dairy cows yielding close to 60 litres of milk daily. Ripon went from being jobless without a steady income to a successful entrepreneur who brings home over BDT 50,000 (USD 605) every month. The couple plan on giving their daughters the best education possible. They hope that their daughters can build a better life for themselves, and not have to endure the struggles their parents had to go through. Dairy farmers gather at the milk collection and chilling centre. BRAC Dairy has managed to effectively address the gaps in the market value chain and create opportunities for people like Ripon to shine as micro-entrepreneurs. Our focus of operations was to sustain the milk farming sector by mitigating issues like unfair pricing, high milk wastage before distribution, and no direct reach to the end consumer – all of which discouraged rural farmers from getting involved. The initial approach was to establish chilling centres that preserved the farmers’ milk until being properly transported for further processing. This results in lesser milk wastage and allows farmers to directly sell their product without third party interference. We then focused on building facilities to process the raw milk into various consumables, such as butter and curd, and a strong retail network to push the end products into the hands of consumers. Following that the approach was to inject practical innovations, such as providing digital fat testing (DFT) and automatic milk collection unit (AMCU) devices to community collection managers. This allowed collectors to quickly and effectively analyse fat content in a given quantity of milk and pay farmers accordingly. The introduction of such technology helped maintain fair pricing policy for all and a level of transparency that the farmers would have not benefited from before. 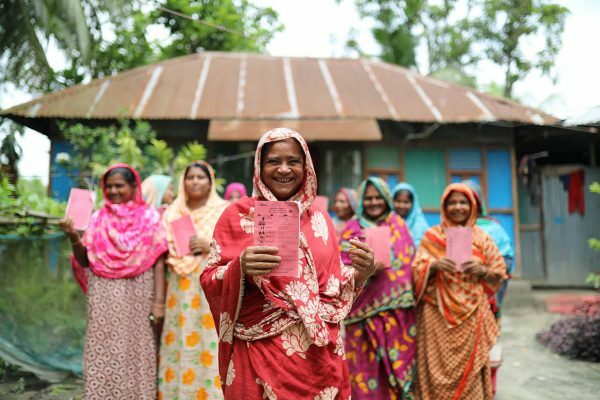 Like Ripon, over 3,000 people in Pabna have found a sustainable source of livelihood in dairy farming through BRAC Dairy’s interventions. Ali Iqbal Murshed is an external communications specialist at BRAC.